What does one do on quiet autumn days in between chores? Revamping my blog was today’s little job. My website is under improvement, my wiki page has been updated by an editor, so this seemed a logical thing to be doing. Of course I should be working on my extra John Clare chapter but I am still mulling it over. I’ve now found how to display my blogroll properly and added some interesting poets to it. If anyone would like to be added, get in touch, and it would be nice if more people would add me to theirs. Blog hopping is great for discovering poets and reading more of the work of poets you already enjoy. I’ve also worked out how to display a picture of my own choice, so I hope the fairground photo I used on my children’s poetry book, Kids Stuff, will cheer up the appearance of this blog for a while, until I get bored with that. Oh the fun! I’ve also updated my What’s On page because google calendar seemed to not want to play ball. 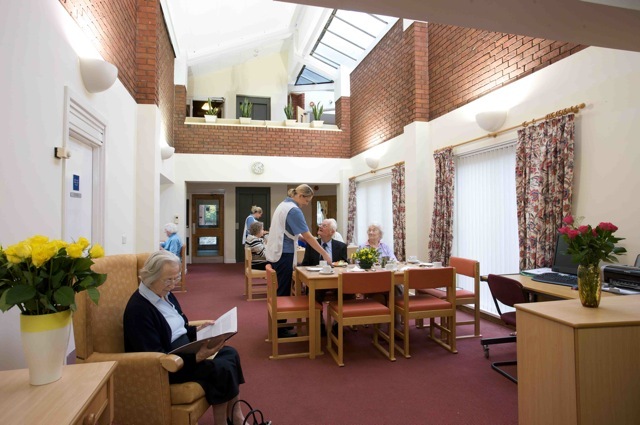 I enjoy doing the occasional reading for The Stroke Club so this year I have branched out and put together an event for Crossways, a residential home for elderly people who cannot look after themselves. This is the first time I have sung in public accompanied by my husband on the piano, but I know that a few Christmas songs and carols would brek up the readings and be fun for the residents. They particularly enjiyed the readings about Christmas past, such as extracts from John Clare and Charles Dickens. As part of the event, they wrote some lines for a group poem in the interval. Here is the group poem. Christmas is a time to be happy and joyful. Christmas is a time for families when we all meet together to sing songs of praise and to honour the birth of Jesus. We must all be grateful for everything we receive, be nice to our family and friends. We must think of everyone and about all the poor animals who need our help, especially at Christmas time when so many are cruelly abandoned. This shiny new festival was a joy from start to finish. I wasn’t able to attend any of the Thursday events as I was in Oxford doing two readings with the wonderful John Foster, but we arrived in good time for Philip Gross’ reading. He was, as ever, wonderful, and was joined by accordion player Mike Adcok, whose own compositions resonated hauntingly with Philip’s words. Philip and I were booked to read together at the LRB bookshop in November 2010, which was unfortunately postponed. We are still seeking opportunities to read together. We both write for both children and adults – and make little distinction between them, as both deserve well crafted and intelligent verse. The next event we attended was with George Szirtes, Nigel McLoughlin and Kviria, the Georgian harmony singers. The venue at Francis Close Chapel, was perfect for the meditative poetry of Szirtes, who, as I am sure people know, is an excellent reader, always leading his audience on a journey of discovery. I hadn’t realised before this event what Nigel’s Ulster accent would add to his poems. The music of them was enhanced for me. Nigel and I were both published by bluechrome, so we shared some commiserations over their mysterious disappearance.The singers were enchanting. We were sorry we had to miss the last five minutes to get to John Cooper Clarke’s performance whish turned out to be not to our taste. However, there was a huge audience of people who were loving it, so we slipped out unnoticed after a while. The next day I had to concentrate on my own two events. The reading at Waterstones was fun, although it can be somewhat challenging at times to make oneself heard on the ground floor of a busy shop. 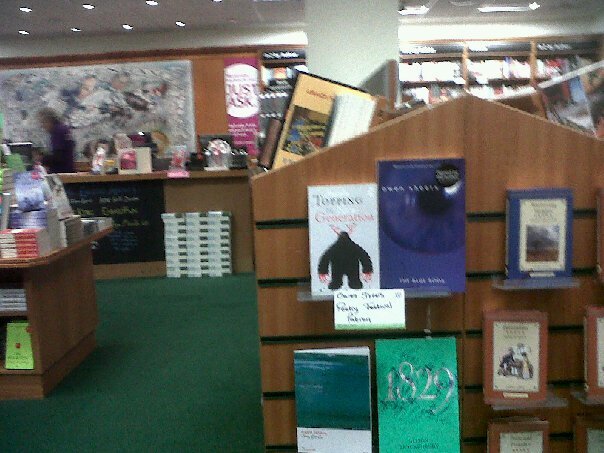 It’s very good to see my books in a prominent position on the shelves! 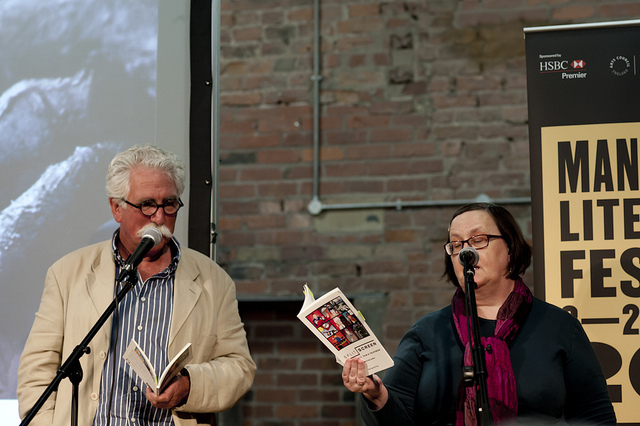 On the plinth in the poetry section my book is cheek by jowl with one of Owen Sheers, festival patron, ace poet and thorougly lovely person. In the afternoon I was giving a multi-media talk on John Clare. I chose to structure the talk around arguably his most famous poem, ‘I Am’. This allowed me to concentrate on the positivity of his life rather than the asylum years. The representative of the sponsors, This England magazine, commended my approach. I do not see Clare’s life as tragic despite his mental illness. He lived it intensely and had great joy in his love of nature. Shortly after I had finished handling questions and packing up, we dashed over to Francis Close Chapel to hear Gordon Tyrrall singing his settings of Clare songs, accompanied by his friend Caroline on the flute. I know these songs well, as I play the CD (A Distance from the Town) , but I had heard them all live before. Gordon has a gift for composing tunes which bring out the words and meanings of the poems with great sensitivity. His performances are enhanced by his obvious enjoyment in sharing his talents. John Hegley, unlike the other John mentioned above, did not disappoint us. This was an extraordinary evening of fun, poetry and music. Hegley is an engaging performer, and I have seen him before, but I had never seen him play his mandolin accompanied by a fantastic jazzy double bassist. See, Hegley is a stunning wordsmith but he can also amuse, impress, involve and entertain. Hats off to him, I did not want this concert to end. Next day was a little quieter in the events I sought out. We went to hear Cliff Yates, fellow Salt poet, give a quirky reading to a good crowd. He was joined by singer/songwriter Men Diamler, who provided a good contrast: his angry young man style set up some lively tensions with Yates’ gentle and laid back delivery. Later at the same venue, Angela France gave a strong reading. She was joined by Jennie Farley, whose narrative poems I had not heard before. This was a lovely reading. I knew Angela’s work already and enjoyed her readings on other occasions. The last event I went to was Buzzwords. I will be leading this in September so I wanted to get a flavour while I was already in beautiful Cheltenham. Pat Borthwick was the guest. I have been familiar with her work for a long time and like it very much. The workshop gave me three quick drafts which I intend to work on when I have some time, and the standard of the open mic before Pat’s reading was truly impressive. Angela is an excellent event manager and host as well! Pat’s own reading was both powerful and entertaining by turns. Cheltenham is very lucky to have such a great event happening every month. Buzzwords is running its first national competition, so do get some entries together to support this smashing event. Anna Saunders and her team deserve hearty congratulations for the success of the first Poetry Festival. Let’s watch it grow. Mince pies are like poems: you have to fill them with the best things, deeply packed. In their case the best mincemeat you can afford. Making your own is just not worth the trouble. Trust me, I did it once. 2) Mix with MILK not water. It makes it easier to handle and then you can roll it out really thin. You can roll out a little more after using the cutters to get your rounds. The thinner the pastry, the more delicate and yummy the pies. It’s quite nice to cut stars out for the top for some of them, for a change. After they are baked, sift half of them with icing sugar. 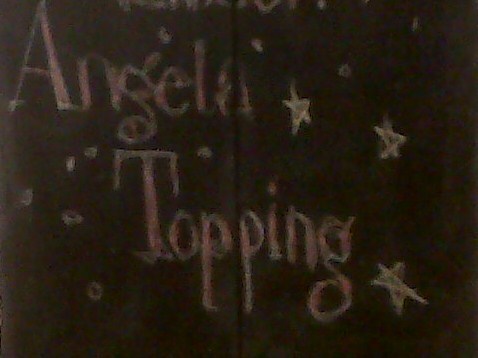 Not everyone likes this topping, so offer a choice. If possible serve still warm. A little clotted cream adds an extra special touch but allow people to put their own on as it melts fast. 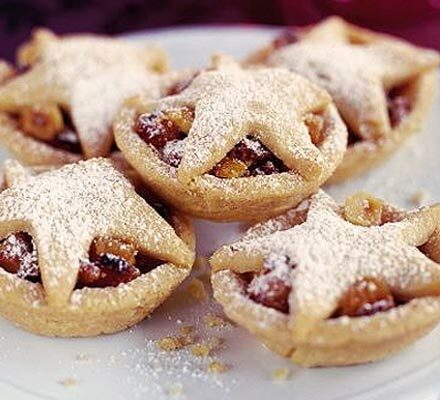 Home-made mince pies are millions of times nicer than the ones you buy in the shops. Go on, treat yourself.